I’m not sure what the deal is, but people seem to be spotting BLMs in the strangest places. When I created this site I assumed all BLM sightings would be, you know, IN REAL LIFE, but apparently I was wrong. Beggars can’t be choosers though, so here we go. I am plagued by restless nights, so I watch a lot of late night T.V. 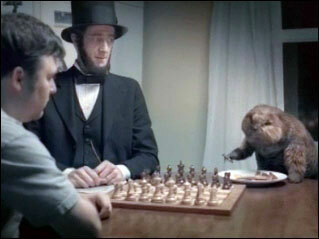 For the past few months, I have been seeing this ad for Rozerem with Honest Abe and… A BEAVER!!!! The beaver is one of the official mascots of restless nights! Go BEAVERS!